Aesthetically built in the traditional architectural style of Ladakh, Hotel Caravan Centre is set amidst the rural ambiance of Skara, a rather quiet part of Leh town, capital of Ladakh. 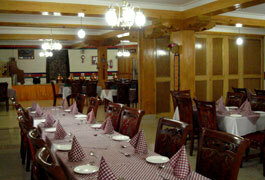 It is conveniently located midway between Leh Airport (03 kms) and the City Centre (02 kms). An exclusive garden retreat tucked away from the congested city centre and its chaotic market areas, the hotel nestles amidst scenic surroundings overlooked by the Stok Khangri range of the Himalayas. The distance between the hotel & Leh Bazaar is a mere 10-minute-drive or a 20-minute walk amidst the sights & sounds of this quaint town in the trans-Himalayas. Established in 1989 as a small family venture, the hotel has grown over the year to its present position as one of the top of the line hotels of Leh. It is managed by the local owner family with personal care and sensitivity towards the comfort and convenience of the guests, lending to it a warm homely ambiance, especially suited for families and lovers of quiet holidays. Backup Generator, Limousine Service Available, Business Facilities, Conference Hall, Bar, Travel Counter, Restaurant, Baggage Storage on Request, Spa/Massage/Wellness, Wedding Services. Cable/Satellite TV, House Keeping, Bathrobes, Slippers, H/C Water, Wakeup Calls, Internet Access, Microwave, Desk, Toothbrush/Razor on Request. User reviews for "Caravan Center Hotel Leh"